Shape NC: Healthy Starts for Young Children is a six-year, $6 million initiative of Blue Cross and Blue Shield of North Carolina (BCBSNC) Foundation and The North Carolina Partnership for Children, Inc. (NCPC) created to increase the number of children starting kindergarten at a healthy weight. Shape NC assists communities across the state to promote healthy eating and active play among North Carolina’s youngest children, from birth through age five. The initiative works with child care programs to instill healthy behaviors early on, creating a solid foundation for a healthy life. In its first three years, Shape NC has engaged 19 communities spanning 27 counties to improve healthy eating and active play for over one thousand of our state’s children. Shape NC has accomplished substantial results in the first three years. As a result, the BCBSNC Foundation and NCPC are expanding the initiative over the next three years to build on the solid foundation already created to improve the health of our youngest North Carolinians and the communities in which they live. At a time when the nation is facing rising health care costs and high obesity rates, Shape NC is taking a preventive approach to proactively address the issue, focusing on the state’s youngest children. Approximately 38 percent of North Carolina’s children are enrolled in almost 5000 regulated childcare centers, where they receive most meals and spend most of their waking hours. How does Shape NC work? Shape NC helps communities and child care centers develop environments, practices and policies that encourage young children to be healthy. This is accomplished by creating a strong and vital network of local experts and programs to provide ongoing support to centers in instilling healthy behaviors early on that create a solid foundation for a healthy life. Three of the major statewide programs are Be Active Kids®, Preventing Obesity by Design and the Nutrition and Physical Activity Self Assessment for Child Care (NAP SACC). 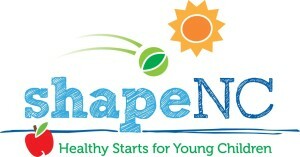 Shape NC works across the Smart Start network, led by NCPC, to engage communities. Smart Start partnerships formed local community action planning teams to develop and implement an Early Childhood Obesity Prevention Action Plan. Each partnership also identified one local child care center to transform into a model of excellence for nutrition, physical activity and outdoor learning environment best practices. Shape NC works at the state level through the Early Childhood Obesity Prevention Task Force at the NCIOM helping to develop recommendations that address barriers and ensure systems and services across the state are available to improve young children and their families’ physical and nutritional health. What results has Shape NC already seen? Child care centers across North Carolina almost doubled the number of healthy best practices adopted, increasing the percent of best practices met from 40 percent to 74 percent. Significant improvements occurred in increasing active play, limiting screen time, offering of healthy food and beverages, and including outdoor play. Children’s Weight: Over the course of each school year, trends showed the percent of children who reach a healthy weight is gradually improving. Active Play: The percent of children being provided with 90 minutes or more of physical activity daily rose from 51 percent to 85 percent. Fruit: The percent of children being provided with fruit two or more times per day rose from 34 percent to 80 percent. Vegetables: The percent of children being provided with vegetables two or more times per day rose from 32 percent to 60 percent. Beans and Lean Meats: The percent of children being provided with beans or lean meats one or more times per day rose from 9 percent to 40 percent. Outdoor Learning: 19 child care centers made improvement to outdoor learning environments including additions such as bike paths and vegetable gardens. Center Staff: 74 staff members at child care centers improved at least one of their own health behaviors, including eating more fruits and vegetables, more physical activity and less sweetened beverages. Smart Start local partnerships bringing together a wide variety of people and organizations including from health departments, child care programs, cooperative extension, local colleges and universities, and health care providers. They created a shared vision and worked to achieve their common goals. The teams have been very effective in implementing Early Childhood Obesity Prevention Action Plans. Smart Start local partnerships raising over $1.2 million in additional resources in the form of volunteer hours, donations of services and securing additional grant funding. What is next for Shape NC? Expand the Shape NC program to 240 additional child care centers. Continue to engage local community partnerships with their changes to support early childhood obesity prevention.